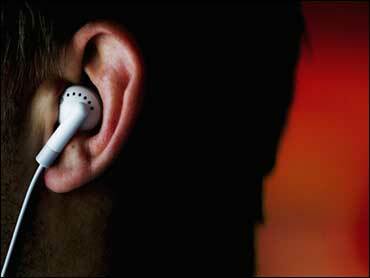 IPods and MP3 players may be doing more damage to young ears than people realize. A recent survey commissioned by the American Speech-Language-Hearing Association finds that more than half of high school students polled have lost some hearing because of how they use the music players. The survey found that high school students are more likely than adults to say they have experienced three of the four symptoms of hearing loss: turning up the volume on their TV or radio; saying "what" or "huh" during normal conversation and having tinnitus or ringing in the ears. Experts say that can come from listening to the devices for too long with the volume too high. "Louder and longer is definitely not the way to use these products," said Brenda Lonsbury-Martin, ASHA's chief staff officer for science and research. "Eventually, that becomes a recipe for noise-induced hearing loss, which is permanent." Experts say because hearing loss happens gradually, it often goes unnoticed until it's too late. They recommend turning down the volume, limiting listening time and switching from earbuds to sound-isolating earphones.